We’ve also been filming and documenting events for the last year: working with PAMI (Peckham Artists Moving Image festival), and a radio show on Resonance FM called The Gravy. They have a great bunch of weird and wonderful musical acts, that we filmed and put our live mixing over, and we have a whole catalogue of them now. We’re also commissioning new works with artists, so a lot of great young talent is going to be shown via our channel. On top of that we’re working on more documentary style content about the political situation now. I want to talk to you about how this project speaks to, lets say, video art, new media history, and the history of artists working with television. Were those things in your mind when you were building the project from the ground up? I mean we’re definitely interested in tactical media, and artists like Ubermorgen who have done major public interventions that have gone far beyond the art world. But I suppose the difference with a lot of those politicised interventions is that it’s through modern technology on the Internet, which came to a bit of a cooling stage in the mid 2000s. What we’re doing is a bit different because rather than intervening in something that people aren’t aware an artist is behind, we’re asking people to actively be involved. Television seemed to always be cast as the twentieth century villain, as the culture industry’s primary tool for twisting reality into a simulacrum of itself. So it’s interesting to think of it being used as a medium for the dissemination of material unmediated, and unfiltered through the corporate sieve. I was just thinking about Black Audio Film Collective, their film Handsworth Songs, and how important that still is today. They were essentially a group of young, disenchanted youth that wanted to talk about things from a perspective they felt lacked a voice. It’s a shame, but it feels like the same situation is happening now and coming together is maybe the best way to go against it. Also I was thinking about the history of TV, and how it used to be that maybe there’d only be one television on the street. So it was kind of an event to watch television right? You’d have all your neighbours coming around to that one house, lucky enough to have a TV, and it became a communal activity, creating a sense of community around that event. Hopefully something similar will happen here. Because of the lengths people will have to go to view, maybe something different will come out of it. So how can people get involved with Superlative TV? 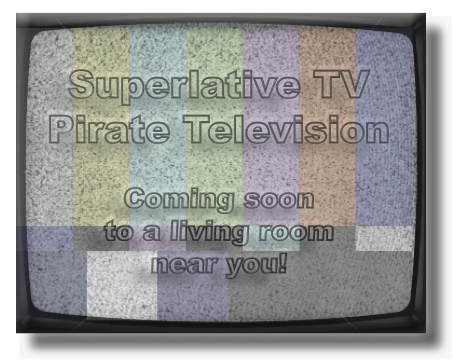 We have a website at www.superlativetv.com, and a blog at www.superlativetv.tumblr.com, that’s one way people can keep up to date with what we’re doing. But what we’re really encouraging people to do is email us on antenna@superlativetv.com with any ideas they have for broadcasting. We want to help people to make programs; we have the equipment, we’ve got the monitors, we’ve got the cameras. We want to help people to find their voice on the medium of television. So give us an email. If you’ve got any kind of film, or even something that already exists that you want to show, we’re more then happy to have a look and put it on the channel. Is this an international call? ambon_pereira | Thu, Oct 11th, 2012 3:47 p.m.
i almost wonder if you could apply for funding/sponsorship. but how are you going to get around the fact that all of these newly available wavelengths will soon be auctioned and owned by private industries, mobile companies and etc? i imagine they will be quite ruthless in enforcing that ownership. but in the meantime, i love the idea of people reinvesting in analog networks. maybe in the long term it will develop into your own version of the mesh. good luck!